Place a large pot over a medium heat and melt the butter. Stir the onion into the butter, and saute for 3 minutes or until the onions have softened and have started to brown. Add the sliced carrots, chicken stock, cayenne pepper and salt to the pot. Bring the contents of the pot to a boil, then reduce the heat to a simmer. Simmer the soup for 15 minutes, or until the carrots have softened. Puree the soup. I use a hand held stick blender placed directly in the soup pot to complete this step (see Note 1). 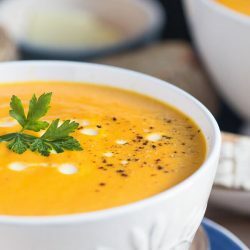 Blend the soup until it is uniformly smooth, and no pieces of carrot or onion are visible in the soup. Stir in the cream and gently reheat the soup. Do not allow the liquid to boil at this point as this will cause the soup to split (see Note 2). Season the soup with a little black pepper, and additional salt if required. If you do not own a hand held stick blender, carefully transfer the soup to a food processor or blender and, following the manufacturer's instructions for hot liquids, process until smooth. Return the blended soup to the soup pot and continue with the recipe. If the soup boils once the cream is added, it may split and separate. You can try to bring the soup back together by giving it a quick zap with a hand held blender, or you can eat it as is. The soup will still taste fine, it just won't be as pretty.